Dwight Schrute is undoubtedly one of television’s most interesting characters. And although this will be the last season of The Office, we have probably learned more from Dwight in the nine-season run of the show than all our years in school combined. 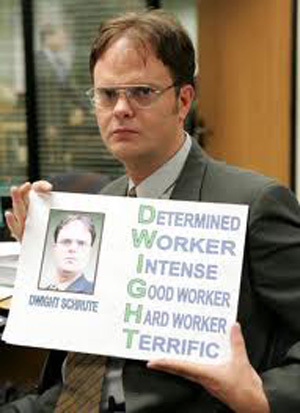 While this knowledge is not always useful, if we’re ever on a beet farm, dueling a coworker over a girl, or the assistant (to the) regional manager of a paper company, we’ll have Dwight to thank for our preparedness. The writers gave us a character with ridiculous logic and principles; Rainn Wilson provided the perfect cadence and delivery. The result: an unprecedented TV character with hundreds of quotable lines. No easy task, but we’ve pared it down to our favorite 30 Dwight quotes here.